So, it's springtime in Slavia and one's thoughts go to ... apparently, killing things. We actually have a theme this issue and all-but-one of the articles this time deal with matters martial. Probably coincidence (I just publish what I get), but interesting nonetheless. Of course, if you would rather read about costuming or architecture, you'll probably just have to start sending in articles! We do appreciate everything you send our way. We don't always publish what we get, but if it will fit, we're happy to get it. My special thanks to Peotr for his financial contribution this quarter. The soldiers were young, but not any younger than others who traveled to the eastern front. They were sons of nobles - Makgrafs, Landgrafs, Barons and Princes. Yet this was not unusual - their older brothers were already battling the Tartars in Moravia. They were called knights, but this was honorary, as their training was scant and their field experience nil. Their passage had been deliberately slow, with part of each day spent in arms practice, foursquare defense and partnership discipline. Still two days out from the heart of battle, they rested easily by the evening fire and related ancient stories of valor - jokingly replacing the heroes with themselves. A slight breeze caused the embers to ebb and surge and cast ghostly red shadow fingers into the trees. The sentries would later claim they saw spirits dancing in the swirling smoke and leaping flames. They did not see him come! Herman von Wartburg was nominally captain of the small company. He was, after all, several weeks older than the next in line. He was not certain he was the first to sense, and then see, the stranger in their midst, but he was the first to rise and claim his sword. The smoke parted suddenly to reveal the aging man with arms stretched wide, cloak open to show that he was unarmed. He gracefully folded to sit on the ground, withdrew his leg-spike, and plunged it into the rocky soil. Herman had heard of this gesture but had never seen this display of peace and portent threat. He clumsily sat himself and placed his dagger on the stones, not sure its finer blade would hold up to fierce abuse. The other knights removed hand from hilt but remained standing in cautious alert. The silence around the fire became a palpable, churning force. The man was legend! Their fathers spoke of his deeds and stories with a sense of awe. The Gusari was here! "If I may be so bold, sire, you must know of our mission. Are there any words you can share that will aid us in the coming days? A song? A prayer?" Of elements that guide both body and soul. And forged from birth to a knighthood goal. Whose artisan skill is oft hidden from view. A hauberk of links to 60 thousand grew. By practice the squire wears thin on the post. On mandrel to gage so, first to the last. To focus on duty far beyond self. To pile up like coins as proof of much wealth. To suffer alone against nature and strife. Guided by pattern sure born to this life. Life's work to seek valor for consort and lord. For one knight unique, to self like his sword. But timing of action, peace and fine passion. Closed links become fused in coals well chosen. As symbol of smith art and ability. "Five simple rules that define the way of the warrior," pondered the young captain. He looked about to observe that all of the knights were deep in thought. "Are you then a knight also?" asked Herman's fledgling cousin, who must have slept through all the stories of his youth. Knight, storyteller, merchant, singer, shaman, magician. Confidant of princes, friend of monks and traveling friars, guest of the beloved Elizabeth of Thuringia. The Gusari was possibly the only man welcome in all countries from the Black Sea to the Baltic. They say he is a rightful prince of the Alani, with a heritage 3000 years old. Yet by choice he plays with children over conference with elders. The crossed tryzub pendant around his neck bespeaks of a mixed Christian and of a mysterious ancient rite. He speaks well of the Lord but prays alone in the forest. The Gusari rose to his feet to stand in the swirling smoke that seemed to cling to his presence without touching - caressing, knowing, searching. "I was," he whispered. "Long ago." "But, I thought once knighted it was for life," stammered the soldier. "Let me tell you a story - then you can judge." A sword appeared suddenly in his hands. No one dare move and they hung on his words. And long cloak of black for to grace our back. Willing death by blood is now our right. In battles to avenge in smoldering rage. Who guard the hill from charging hoard. Saves the day with our comrades true. With lance reversed and arrows broke. For on this dark day our liege lord has fled. The embers flared to greet a shooting star while the smoky mist sank close to the ground. Nonetheless, eyes stung and young throats were raw with pride and shame. In the 13th century, Russian arms and armor began to transition from he old "Norman" style with straight swords, kite shield and simple mail shirt to reflect more of an Eastern influence with sabers, round shields and eastern-style body armor. The armies of central and northern Rus, Vladimir-Suzdal, and Novgorod had much in common with the army of Kiev that they were starting to eclipse. Bows and the war-axe were more important than in Western Europe, but crossbows were still rare compared to regular hand bows in the 13th century. The main weapon was the sword - broad, straight, double-edged, with a grip and a small cross-guard. It was worn at the belt on the left side in a wooden, leather-covered scabbard. The saber first appeared in the 11th century. Russian soldiers also used the axe, the spear (a boar-spear up to sixty cm long with a wide tip), the small metal spear (sulitsa), the pick (used by common soldiers with wooden handle up to 30 cm long and a weight hanging from it by a short chain? ), the oak staff with its ends nailed with iron (called oslopi), the flail (kisteni), and the bow and arrow. In the 13th century, according to Nicolle, the Kievan druzhina cavalry favored the sword and saber, couched lance, light spear, single-edged Scandinavian seax, and Eastern mace. But according to others, the most important weapons were the mace and the bludgeon, to allow quick strikes and the mobility to shift the force of battle, with one or two spears, a saber or sword, a crossbow or bow, a bludgeon, a mace and a battle axe also included in the equipment. Not surprisingly, the light cavalry horse-archers carried as their main weapon the bow and arrow, but they also carried axe, slingshot, and mace. The infantry were armed with an array of throwing weapons, slashing weapons, and striking weapons. Their equipment tended to be simpler than the regular forces, since they were commoners and artisans, not professional soldiers. Their main weapons on the march were the axe, a heavy lance, the sulitsa, a cudgel (palitsa) and a pike. Although, according to Nicolle, in the 13th cent. the Kievan infantry were equipped with javelin or spear, small axe, large dagger, and bows. The infantry made use of both simple longbows and large semi-composite bows covered in birchbark. While some debate the Scandinavian versus Byzantine influence in Rus archery, the arrowheads demonstrate a wide variety of styles and influences. Archers used barbed European arrows and armor-piercing Eastern arrows. Crossbows seem to have been confined to north-west Rus and the area of Novgorod. In the 13th century the Kievan druzhina cavalry armor included tall, pointed helmets, mail aventails (barmitsa), possibly cuirasses instead of or in addition to mail hauberks, perhaps leg defenses, and kite-shaped shields. The Northern Rus' cavalry were similarly equipped. Mail was used for body armor with scale or lamellar cuirasses becoming more and more common. The "Black Hat" horse-archers from the allied steppe nomads wore distinctive full-face-mask helmets reflecting the importance of archery. The importance of dealing with enemy archery was also represented by the Russian helmets with visors to protect the upper part of the face that seem to have evolved from earlier Scandinavian forms. The infantry, depending on their financial resources, might be protected with a shield or metal armor of varying types, and a helmet or perhaps just an iron cap. At this past Gulf Wars, a revelation presented itself. The growth of Slavic personas in the SCA has spawned a parallel growth of Slavic fighters on the field of combat. Many of those I have spoken to have very definite ideas of what they want in the way of armor for their particular persona. As a sixteenth century Russian boiar, my as-yet-unrealized goal has also been to create Slavic armor not out of place during Ivan the Terrible's many wars. My first challenge was to choose armor pieces that suit both my fighting style and the sterling physique of a lifelong couch potato. Needless to say, both are works in progress, but here are some ideas you might find useful in your own armor search. An excellent resource to make your own comparison is available through the Red Khaganate website under "armors," specifically Caravan Armory. In a previous set of articles, I outlined the creation of scale bakherets body armor and naruchi forearm protection. Since that time, I have been researching the armor I have seen in the Kremlin Armory collection. Many of these pieces are ambassadorial gifts to the Tsar and are a mixture of Russian, Tartar , Turkish and Persian styles. However, historical origin was definitely secondary to effectiveness on the field. Without further ado, let us start at the top with helmets common to the mid to late sixteenth century Russia. The most common Russian helmet of this time period was the shishak, shaped much like a Hershey's Kiss [Editor's Note: for a conflicting opinion, see the following article] and probably worn in conjunction with a chainmail camail or coif. They are often depicted with a small colored flag attached to the top and the fancier ones often have either Old Church Slavonic writing around the rim in 1" high lettering, fluting or with ear and neck flaps, though I have only seen this last variety in one artifact in a Novgorod museum collection on-line (which seems to currently be defunct). These helms are pictured being worn by Moscovite cavalrymen in the contemporary Polish painting, "the Battle of Orsha", circa 1514. For the modern SCA fighter, several potential problems are immediately obvious. First, the point stands at least 5 - 6" above the crown of a normal helm and is subject to catching glancing blows, though its potential for shrugging slot shots is very good. Second, to attain the correct look, a bar work or flat strip side panels would need to continue down from the rim to protect the sides of the head under the chainmail. Third, the chainmail would need to be riveted to survive repeated shots from the clubs we call swords, though this form of chainmail is getting much more available and cheaper (thanks to its Third World manufacturing origins). Fourth, the cone would necessarily need to be thinner towards the top to prevent the distended weight problems and resulting additional stress to the wearer's neck. Granted, the drawing process used in making the cone portion would thin a 14 gauge to 16 or 18 gauge near the tip. An excellent look but one open to experimentation in its application to SCA fighting realities. The next helm style is Turkish in origin and referred to by many authors as a chicack or cicak . In the sixteenth and seventeenth centuries, this helm was considered state of the art head protection for the fighting man from the plains of Central Asia as far west as Germany during the Thirty Years War and Oliver Cromwell's infamous 'Roundheads' in the English Civil War. Though widely copied and imitated, the earliest examples are found in Central Asian murals at Samarqand and Buhkara dating to the campaigns of Tamerlane at the very beginning of the fifteenth century. The actual helm has several characteristics seen separately in other styles but when utilized in tandem actually serve to create this particular style of helm. These characteristics are: a sliding nasal bar, a brim over the eyes, ear plates and a neck plate. Other elements, such as chainmail, style or profile of the cap and use of overlapping plates for the ear or neck flaps seemed to be a matter of cultural or individual preference. For example, Poles preferred either a standing comb or a low profile rounded crown while Turks preferred a slightly pointed crown with solid metal ear and neck flaps. The cicaks produced by the Kremlin Armory favored a long, multi-plate aventail over the neck, small visor over the eyes and solid ear flaps with dished out sections over the actual ear of the wearer. Further south, among the Krym Tartars in the Crimea, stylized human faces dished out of a solid metal plate seems to have been popular with the elite, though an active debate amongst armor historians has raged on their actual use in period. The use of fluting on the cap section is less common in all groups, mainly used in Germany, but notwithstanding a few examples in Turkish and Russian helms, in addition to a dishing technique spiraling up the cap to the point called a 'turban' style popular with early Turkic, Arab and Central Asian cultures. In addition, fluting was generally done on lighter gauge helms in period, according to Dr. M. V. Gorelik., in order to strengthen them. The Kremlin Armory collection contains a Russian produced helm with a fluted cap called a lozhchataia, with a ring of overlapping 1.5" wide plates below the rim but over the eyebrows, along with ear plates and chainmail. In terms of armor currently used in the SCA, fluted helms generally add 50-100% to the cost of a helm, dependant upon your kingdom's armor standards and as the resulting difficulty-factor increases with heavier gauge helm caps. I prefer 14 gauge for strength and lightness. If I still fought within the line, I would want the mass afforded by a 12 gauge helm cap to absorb blow impact energy, with lighter gauge ear and neck plates and a riveted chainmail camail for lightness with increased strength. But because I seek to perfect my appearance, I want a unique helm that complements my persona in time and place. As a combat crossbowman, my effectiveness as a hunter is dependant upon my stealth, movement and a steady supply of ammunition. My targets rarely see more of me than my helm over the shieldwall, so I need a low profile helm with no distinguishing brasswork, peaked helm or combed helm cap to mark me as I work. In tourney season, the complete opposite applies so brasswork, stainless steel and fluting would be optimum. It's your call! In 1808, and a simple peasant woman from a village called Lykovo was collecting nuts when she noticed something shiny in the ground. She stopped her work and examined the find, which was to have phenomenal influence on the future of archaeology. The item she found was the famous helmet of Knyaz Jaroslav, and she was standing on the site of the ancient Lipetsk battle of 1216. As A. N. Kirpichnikov, the leading authority on Russian arms and armor, says in Drevnerusskoe oruzhie [Arms of the Ancient Rus], "The helmet of Jaroslav Vsedolovich was one of the first objects with which started not only the study of arms, but of ancient Russian artifacts altogether." The helmet had a profound effect on the popular image of the Rus warrior as well as on archaeology. The gilded conical helmet with a small spike on the top and a large icon of an archangel on the forehead is now perceived as the typical early Russian helmet, and is often depicted in movies and books. This is, however, an untrue image. There are close to 40 helmets dated 10th-13th centuries (37 at the time of Kirpichnikov's publication; more have been found since). Of these, the decoration of only two more helmets is similar to Jaroslav's; there is also scant literary evidence for other icon helmets. The so-called Jaroslav's helmet is considered to have been manufactured sometime in the second half of the 12th century, and was inherited by Jaroslav after several owners. B. 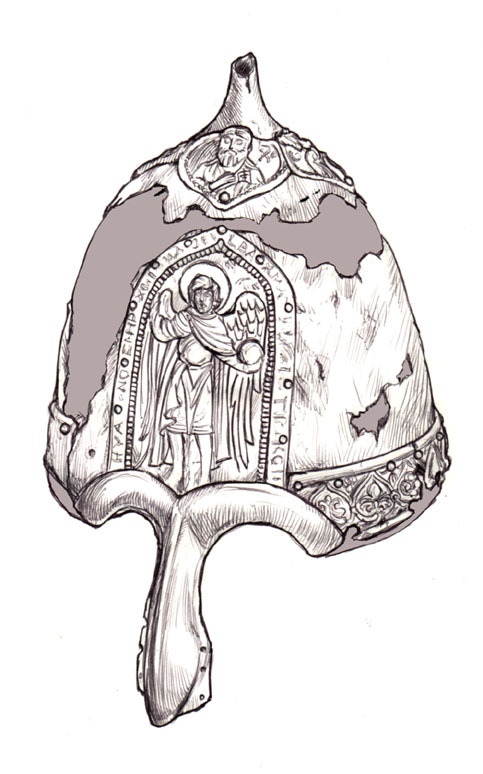 A. Rybakov suggests that the helmet might have even been lost in 1177 by some other warrior, not by Jaroslav in 1216, since there were two Lipetsk battles. In the above-mentioned publication A. N. Kirpichnikov provides a detailed description of the helmet: "The body [of the helmet] is covered with a silver sheet and decorated with embossed, etched, and gilded silver plates: on top - a star-shaped plate depicting the Christ Pantocrator, Saint George, Saint Basil, and Saint Theodore; on the forehead - the figure of archangel Michael with an etched inscription, 'Great archangel Michael, help your servant Fedor.' A decorative band with depictions of griffins, birds, and snow leopards separated by lilies and leaves runs along the bottom of the helm." Kirpichnikov points out a beak-like nasal with gilded brows and five "ears" for an aventail (several of them broken). He also refers to the first publication of the find by Olenin in 1833, which mentioned remains of an iron half-mask (oculars). Traces of the oculars can still be found on the rim of the helmet. The helmet was modified at least three times before it was deposited. Kirpichnikov suggests that the person who attached the silver plates to the helmet was not the one who manufactured them - they are not attached with much attention to detail, since some lettering and design is damaged by the rivets. It is possible that the helmet originally lacked these decorations, and they were added when it was acquired by a wealthier owner. At some point after these changes, a spike was added to the top of the helmet - directly over the star-shaped decorative plate - and a half-mask was riveted to the bottom of the helm, "rudely" covering the archangel's feet. It is based on this evidence that one can easily conclude that the helmet changed hands several times until it was lost, or more likely hastily discarded during a panicked retreat. A similar helmet was found in a kurgan in Nogaisk (not by archaeologists, unfortunately, but grave-robbers). The front of the helmet was decorated with a brass plate about 13 cm. high featuring Saint Procopius and an inscription bearing his name. The last such surviving helmet is different from the others, since it seems to be of Greek manufacture. Now on display at the Kremlin armory, this iron helmet is richly decorated with gold and silver designs, "the Trinity, two angels, two cherubim, two evangelists, and [Saint] Nicholas the wonder-worker." The art style is pre-1250. It is traditionally associated with Alexander Nevskiy, but Kirpichnikov suggests that it could potentially be even older. There is also literary evidence of helms decorated with icons. The Ipatiev Chronicle records that in 1151 Knyaz Izyaslav Mstislavich fell off his horse in a battle with Andrey Bogolubnyi and was attacked by several warriors from his own army, who did not recognize him as his face was obscured by the visor. One of them managed to hit the Knyaz on the helmet where "golden [Saint] Panteleimon" was depicted, and smashed the helm into Izyaslav's forehead. Fortunately, Izyaslav pulled his helm off in time to be recognized, and avoided being killed by his own men. Although icons were not as prevalent on ancient Rus helmets as one might be led to think, they seem to have been not uncommon in the latter part of the 12th and early 13th centuries. The two helmets manufactured in Russia (Lykovo, Nogaisk) are both of type IV by Kirpichnikov's classification, sharing that category with four more helmets. Type IV helmets are characterized by having a conical top and a large half-mask, consisting of oculars and a beak-like nasal. A third helmet, of Greek manufacture, also features extensive religious decoration, and can be dated to no later than the first half of the 13th century. Based on this archaeological and secondary literary evidence one can conclude that such helmets were popular among the rich nobility of the late 12th - early 13th centuries. They co-existed with the more traditional simple conical helmets (type IIA), Tagancha-style extremely tall helms with nasals and brow cut-outs (type IIB), and primarily Nomadic type III helmets like Kovali, which features a full face-mask. Kirpichnikov A. N., "Drevnerusskoe Oruzhie," Sovetskaia arkheologiia 3 (1971): E1-36. Yanin, V. L., "O pervonachal'noy prinadlezhnosti shlema Jaroslava Vsevolodovicha," Sovetskaia arkheologiia 1958. Amid the vast collections of New York's Metropolitan Museum a small and carefully prepared section below the main staircase covers the Byzantine Empire and "Migration Art [Franks, Celts, Goths etc]". One small case holds treasures from Kievan Rus. I spent some time on a single piece (always a good thing to do) sketching it and reading about it. The object is a nearly circular pendant 2 1/8" x 1 7/8", made of gold with cloisonné enamel inlays of red, green, white and blue. Thin strips of gold separate the areas of enamel. The pendant is constructed of two disks of gold attached to each other at four points, as well as at the clasp. 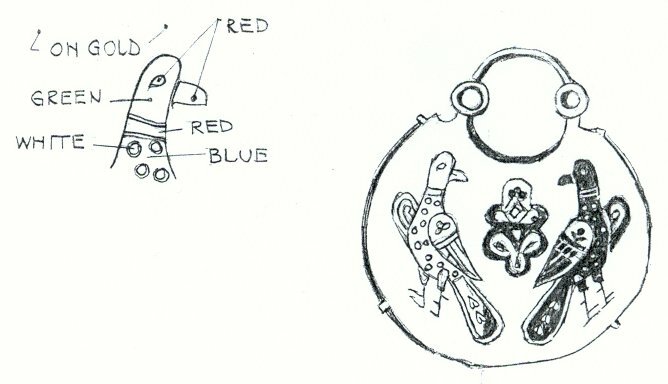 The front disk has two heraldic birds regarding a central item that is described as "a tree of life". An exhibition catalogue further described the reverse (invisible in the case), "elaborate quatrefoil set in acanthus leaves, surrounded by foliate motifs in circular and quadrilateral forms." This temple pendant, called kolti, was worn in pairs as part of an elaborate women's headdress. The pendant's hoops allowed them to be worn by aristocratic men and women during the twelfth and thirteenth centuries. According to the catalogue, "Temple pendants worn at celebrations of the martyr's feast [Borys and Hlib] are usually thought to incorporate both pagan and Christian themes� Similarly the breasts of the birds flanking the tree of life are decorated with symbolic seeds also referencing to fertility." The kolti were found in 1906 at St. Michael's of the Gold Domes Monastery in Kiev. Source: Object accession number 17.190.700,703. Ryszard Sulima Suligowski (Rik Fox, 12647 Burbank Blvd, #108, Valley Village CA 91607, Rik_Fox@yahoo.com) will be appearing in full Winged Hussar glory at the Pulaski Day Parade on October 6, 2002 in Brooklyn NY. For more info, see his web page (http://www.geocities.com/ rik_fox/husaria). Peotr Alexeivich Novgorodski (Gregory Frux, 111 Sterling Place, #3A, Brooklyn NY 11217, 718-789-0334, gfrux@webspan.net) is designing a role playing adventure/scavenger hunt at a Memorial Day SCA event in Neshanic Station, New Jersey (May 23-26th). The theme is "The Journey to the Great Khan" and it is based on Marco Polo's Journals as well as Peotr's. Full information should be listed in the Pikestaff. Marek Bocanek is a Pan-Slavist who is seeking supporters. He writes, "I am student from Slovakia and I am working together with the movement of Slavic unity. We are looking for Slavs that are interested in helping us. We do not ask you for money but for your contributions and support. We want to unites Slavs and create cultural unity. We are now creating Slavic language called Slovio. You can find it on a page www.slovio.com." Keramov, Lyatif. Folk Designs from the Caucusus. "We put a lot of emphasis on maintaining the integrity of the traditional methods in our seminar projects and would like some good resources. Contact Peggy Reedy (dereedy@ shreve.net) if you can assist or are interested in more information." "Dances of the Peoples of Asian Russia," held in Novosibirsk, Russia, July 15-29, 2002. Picture yourself at the Hotel Ob in Novosibirsk for eight days and six additional days on a boat on the River Ob visiting riverside villages, learning the dances of the region from the local peasantry. "The Transylvanian Experience" in Alba Iulia, Romania, July 6-13, 2002. Similar to above. For more information, contact: Rickey Holden, Director, Folkraft-Europe, Ruye Saint-Norbert 6, BE-1090 Brussels, Belgium, rhfe@usa.net. Standard Disclaimer Stuff: Most of us are members of the Society for Creative Anachronism, Inc (SCA) but our Interest Group and its newsletter are not officially affiliated with the SCA. Naturally, then, Slovo does not bear any intentional resemblance to anything that the SCA officially endorses. The original authors retain the rights to their works. Please contact them directly for permission to reprint. Uncredited material is the property of the publisher. The publisher and editor is Paul Wickenden of Thanet (Paul Goldschmidt), 3071 Cimarron Trail, Madison WI 53719, 608-288-0255, e-mail: goldschp@yahoo.com. There is no subscription fee and copies of this quarterly newsletter are available free of charge from the editor. Slovo is also available on-line at the Interest Group website (slavic.freeservers.com).